This webcam possesses the advanced technology. BlasterX Senz3D. Challenge your fancy with the Senz3D. Make your world 3D playground where you can turn everything into a reality. Using depth-sensing technology, the Senz3D enhances a layer of virtual reality to your atmospheres. Creative Sound BlasterX Kratos S3 21 73VF081000000 CREATIVE LABS. Facial Analysis and Recognition. Microsoft Windows 10 (64-bit) or Higher. 8GB Free Hard Disk Space. USB 3.0 port. High quality recording quality in low lighting. Model PD1001 P/N 73PD100100001. Manufacturer: Creative Labs. Features: USB compatibility. Peripheral / Interface Devices: CD-ROM, USB port, graphics card. Still Image Capture Resolution: 160 x 120, 176 x 144, 320 x 240, 352 x 288. In the event that product image and text disagree. Server units designated "bare" may purposely omit certain hardware components, as they are intended to be built upon. Nonetheless, we will strive to do right by you and ask for your patience as we resolve any issues. Part Number: Creative 73VF077000001. Creative Labs Live! Cam Sync HD. Interface: USB 2.0, Product colour: Black, Mounting type: Clip/Stand. Minimum processor: 2.4GHz, Minimum storage drive space: 500 MB, Minimum RAM: 512 MB Enjoy HD video chatting instantly! BlasterX Senz3D Webcam. The BlasterX Senz3D is now certified with Windows Hello: Sign in to Windows with just a look, a touch or a wave. You'll get enterprise-grade security without having to type in a password. P/N: 73VF077000001. SKU: VF077000001. MPN: 73VF077000001. Cam Sync HD Webcam. Product Type: Webcam. With the Live! Simply plug it into your PC or Mac and you're all set. There's no need to install any drivers from a CD! Part Number: Creative 73VF070000001. Creative Labs Live! Cam Chat HD. Simply plug it in and play - no software installation required! You can also download the free Live! Built-in noise-canceling microphone You won't need to compete with background noise in order to be heard with the built-in noise-canceling microphone. Creative Labs Live! Cam Chat HD. Built-in noise-cancelling microphone eliminates background noise for clearer voice chat. General Interest. Product code: 73VF070000001. Cam Chat HD 720p 1MP USB 2.0 Webcam. USB Pens / SD Cards. Full HD No. Interface USB 2.0. USB required Yes. Logitech Z200 2.0 Channel Black Speakers (980-000812). Tablet Cases. Product code: 73VF077000001. Cam Sync HD 720p 3MP USB 2.0 Webcam. Supported video modes 720p. USB Pens / SD Cards. Full HD No. Interface USB 2.0. USB required Yes. Trendnet Bluetooth 3 Mbit/s Wireless Adapter (TBW-106UB). TALK FACE TO FACE WITH SHARP VIDEO AND CLEAR AUDIO LIVE! VIEW LIVE! AUDIO LIVE! CAM SUITE 800X600 VIDEO 1.319.99MP PHOTO. I AM EASY AND WILLING TO WORK WITH YOU. You may also be interested in. 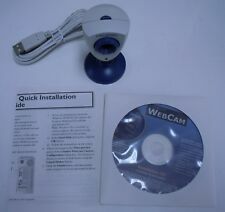 NEW WEBCAMPC850 CREATIVE PC CAM 850 WEBCAM....j. » Manufacturer Part Number: WEBCAMPC850. » Category: Webcam >. » Warranty: 1 Year Manf. Product Code: CW-WEBCAMPC850. » Cubic Weight (kg) » Actual Weight (kg): 1. This webcam possesses the advanced technology. BlasterX Senz3D. In order to relish the experience, the webcam must be ideally placed above the display ad angled vertically towards the user's face for best performance. Product Model #: 73VF081000000. Product Model # 73VF081000000. BlasterX Senz3D Webcam. Product Line: BlasterX Senz3D. Manufacturer Part Number: 73VF081000000. Manufacturer: Creative Technology, Ltd. Limited Warranty: 1 Year ". This is a new in box, never opened Creative LIVE! CAM Sync HD. Unit is as described on the box. Creative Live USB 2.0 Webcam Camera Multi Mount Headset Included "NIB"
Cam Notebook Ultra. Factory sealed. Creative Live! Cam Optia Webcam. AnschlüsseUSB 2.0. Auflösung640x480 Pixel. 640x480 VGA. CREATIVE WEBCAM PRO. INCLUDES CD & USB. Used but fair condition. Functioning 100%. Creative Webcam Live Webcam! 640 x 480 Video Resolution. Creative Lapel Microphone. with High Quality Video and Audio. 6' USB Cable. Multi attach base works with almost any monitor: Any Flat Surface, Notebooks, Flat Panel Display. CREATIVE LABS VF0070 WEBCAM FOR NOTEBOOKS GOOD USED CONDITION FREE SHIPPING! 5 out of 5 stars - CREATIVE LABS VF0070 WEBCAM FOR NOTEBOOKS GOOD USED CONDITION FREE SHIPPING! 10 product ratings10 product ratings - CREATIVE LABS VF0070 WEBCAM FOR NOTEBOOKS GOOD USED CONDITION FREE SHIPPING! Webcam instant - creative mint in box. I have Creative Live! VF0230 1.3MP USB2.0 WebCam for sale. Condition is used, works perfectly. Creative Webcam Instant Web Cam 640x480 Video 1024x786 Snapshot Resolution. Condition is New. Shipped with USPS Priority Mail. Creative Live Cam Video IM ULTRA, Complete with software disc and instructions manual. 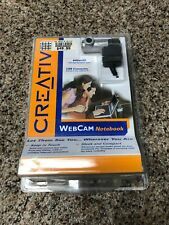 Creative Labs Webcam Notebook Camera with Clip PD1170 New Sealed. Condition is New. Shipped with USPS Priority Mail. NEW Creative Labs 73VF070000000 Live! Cam Chat HD Webcam VF0700. Condition is Used. Dispatched with Royal Mail 1st Class. • Model Vfo520. • Creative. Allows you to capture still images/full color video while communicating face-to-face with others on the Internet. Includes installation guide, software and USB cable. MPN 73VF004000012. Model Webcam Instant. Included Accessories Microphone, USB Cable, Headset. Platform Search PC. Still Image Resolution 640x480. Product Details. Creative HD Live Cam 720p for Monitor or. Laptop USB. Condition is Used but looks like new. Model VF0040. Special Features Snap-Shot Button. VoIP Features Skype Certified. Included Accessories Headset, Microphone, USB Cable. Included Features. Still Image Resolution 640 x 480. Image Quality.